Researchers in the new Complex Social Interaction laboratory at WSU are using body-worn cameras and advanced scientific tools and techniques—such as data analytics, biometrics and machine learning—to examine the complex factors that shape interactions between police and community members. The CSI team is using the information to design algorithms and new software to help public safety agencies improve police-community relations, reduce conflict, cost and liability, and enhance the health and well-being of law officers and their communities, Makin said. Since its launch early this year, the lab has analyzed more than 2,000 police-community interactions and numerous records from law enforcement incidents to identify, code and catalog key variables associated with a range of outcomes, positive to negative. Location, lighting, time of day, number of people present, gender, race, verbal and physical stress and intensity of the interaction are among the myriad contextual factors assessed. The novel approach combines automated and manual coding to generate more objective and holistic descriptions of police-community interactions than other existing methods provide, Makin said. Preliminary results of the studies recently appeared in the Journal of Research in Crime and Delinquency. 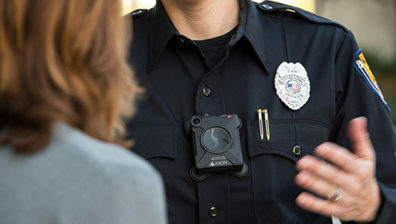 To aid the CSI research, Arizona-based Axon (formerly TASER International) is equipping the lab with its latest body-worn camera hardware and software. The donation will enable the researchers to undertake a range of experiments exploring the situational and dynamic factors associated with decision-making and the efficacy of police training. “The research that David Makin and his team are doing at WSU is groundbreaking,” said Rick Smith, Axon CEO and founder. “It represents another exciting avenue for body-worn camera usage, potentially leading to the development of tools that will make body-worn camera footage more useful for training and for understanding patterns of behavior. Our core mission is to protect life, which means protecting officers and citizens alike, so we’re thrilled to support researchers like those at CSI who obviously share that mission,” Smith said. “This is an excellent example of a win-win public-private partnership with potential to generate cost savings for police departments and bring new products to the market,” said Brian Kraft, director of business development for WSU’s College of Arts and Sciences and director of innovation and industrial research engagement for the Office of Research. The CSI lab also recently contracted to work with the Applied Physics Lab of John Hopkins University on further research related to body-worn camera use. An expert in police training and technology, Makin is especially interested in identifying the situational and dynamic factors associated with key performance indicators and the decision to use force. While statistics relating to police use of force have long been collected and made available to the public, Makin said the information provided by those statistics has been limited, indicating only whether use of force occurred and the type of force used. The software being developed by the CSI team could be used in concert with official agency data to help supervisors evaluate their organizations’ approaches to officer training, policies and protocols and identify areas for improvement. The diversity of the researchers’ expertise areas provides important added perspective, said co-principal investigator Rachel Bailey, assistant professor in the Edward R. Murrow College of Communication and director of the Communication Emotion and Cognition Laboratory at WSU. “By using multiple metrics from interdisciplinary lenses, we may be able to understand more accurately how officers are interacting with different publics in circumstances that are sometimes very stressful,” she said. Bryce J. Dietrich, assistant professor of social science informatics at the University of Iowa, is another prominent member of the CSI team of faculty and graduate students. The first-of-its kind CSI lab is funded by a $50,000 WSU Grand Challenges Seed Grant aimed at advancing social justice and promoting an informed and equitable society. Further support comes from a National Institute of Justice grant awarded to WSU researchers to study the effects of legalized marijuana on law enforcement and crime in America.